Yesterday's developer roundtable gave some interesting nuggets of information, with Shigeru Miyamoto confirming that Pikmin 3 will now launch on the company's new Wii U console, skipping Wii all together. Miyamoto explained the console is just a "much better fit" for the series, and having seen the Wii U controller we can't help but agree. How do you feel about Pikmin 3 not launching on Wii? This little piece of information just made my day and definitely made up for the lack of first party Wii U titles revealed at E3. I know the tag says Disappointment... but I'm actually kinda excited to see the lush environments in HD. I think Pikmin would work a lot better on the Wii U. It would have both the controller screen and much greater system power to give it a new twist so it doesn't feel like another port of Pikmin 1 and 2. Definately looking forward to this one. I'd really like to see this as an launch title. That would just be a great first party game from day one. Something that the 3DS did not have. I can't possible imagine how the environments will look from Olimars point of view on the U.
I've been waiting for Pikmin 3 for a long time. I'm disappointed it won't be on the Wii, but maybe it will be a better game in the long run. The slow painful Wii death march begins. I can hear the drums. And my Wii saying "I'm not quite dead yet" while I'm watching the Kirby video, but as nobody somehow has said it yet - I think this is the first nail in the coffin. On a brighter note - Pikmin in HD, yes. Stylus DS style control, yes. Having an excuse to convince the wife we need to spend $300 on a WiiU (my 2 kids love pikmin), yes. They should use the controller screen (can we get a cool nickname for this please, Wiiscreen, Uscreen?) to give you a fist person view so Olimar can watch as 100 Pimkin tear up one of those big floating guys. OK, now I'm excited. The awesome graphics combined with what Miyamoto's mind can come up with for 2 screens will make this a spectacular game. Here's hoping it will be a launch title bundled with the system just like Pikmin 1 on the Gamecube. Remember, you can play the Wii U with Wii accessories, so people who liked NPC Pikmin will probably feel right at home. I think the tablet/touch screen interface really makes sense for this one. I'm just glad it's finally coming, whatever system they put it on. Wow, this is super exciting! YEEEEEEEEES!! Pikmin 3 officially exists now! NL, you guys should refrain from saying that particular games will "launch" on Wii U. That implies that it's a "launch" title. Disappointment? Pikmin will be amazing in 3D. Plus, commanding hoards of Pikmin with the Wii U's Touch Screen sounds very comforting. Doesn't surprise me in the slightest! And this won't be a launch-title since I think the franchise is not populair enough. I don't see how the USA gets New Play Control Pikmin than Pikmin 3. We also wan't New Play Control Pikmin 2. 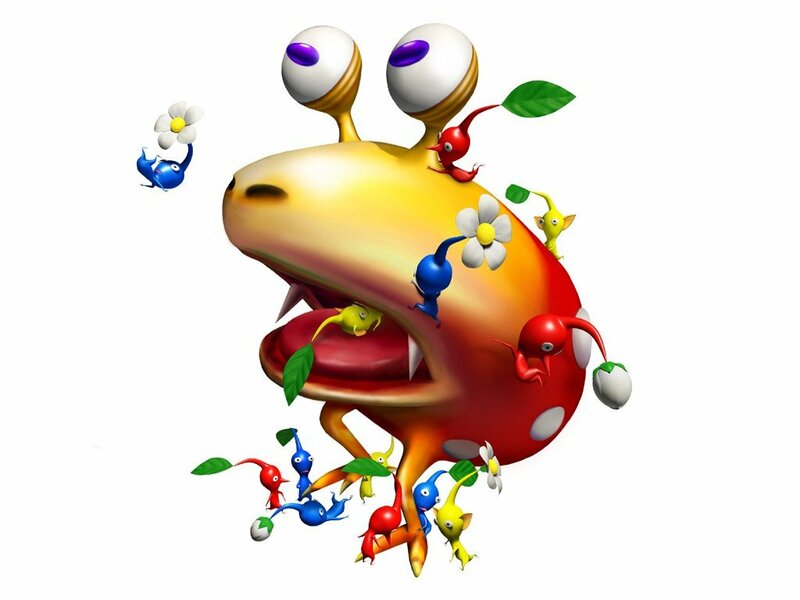 Can someone at E3 ask for a comment on when Pikmin 2 will finally come to the USA? So, where's the sense in playing Pikmin with touch screen tablet? I played the hell out of ALL pikmin releases so far and I can't come up with any useful idea how the pikmin experience can be seriously enhanced by tablet touchscreen controls... Any grand scale idea (aside from just item selections, etc.) would totally change the game mechanics: Pikmin is NOT a full RTS game, neither is it just puzzle or action. Enlighten me. I'm still wondering why Pikmin 2 New Play Control didn't get a US release. @ 28 Pikmin 2 probably didnt get a release due to all the products in in it like duracell battery. Too expensive for Nintendo to clean up the red tape and still be able to make a profit. Finally. Its about time Mr Miyamoto. Now just get your buddies on F-zeroWX or what ever your going to call it and ill be a happy camper. I can live will shelling out up to $399.99 for the Wii U if it has decent launch games available. Don't pull a 3DS launch this time Nintendo. Pikman 3 would make an excellent launch title, along with others. I loved playing the pikmin games, but I can't believe pikmin 3 isn't launching on wii, because I probably won't get wii u. Will it be on the 3ds, then I would get it.